Are you insecure about your shelves? When you are standing in your house staring at an empty shelf, it can feel really intimidating to decorate. Where do you begin? What if you don’t have any books? How does everyone on Pinterest make their shelves look so good? Why do I feel so nervous about decorating this shelf, anyway? I was talking with a friend recently who was having a really tough time wrapping her head around decorating a shelf. She had tried some different arrangements of things, but nothing really clicked. She couldn’t figure out how all of the magazines made their shelving look so put together, while her shelves just didn’t look all that pretty or interesting. She had all but given up, feeling overwhelmed and frustrated. She told me she just didn’t think she was cut out for decorating. I know that friend of mine isn’t alone, because I’ve felt the same way. And I know others have, too, because many of you expressed similar struggles to me in my reader survey earlier this year. I wasn’t always confident with interior styling, but now it comes much more easily to me. I used to feel like my decorating just didn’t quite look as pulled together as it should but after studying tons and tons of pictures in magazines and online, I learned some basic concepts that have helped me become a better interior stylist. 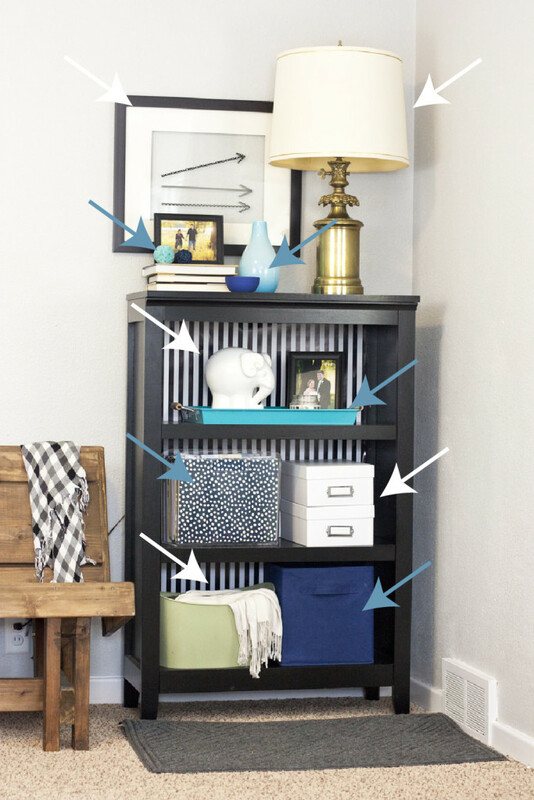 Since I recently decorated a shelf of my own in my living room, it seems like a good opportunity to break down every element of it so you can learn how I go about styling my shelving. 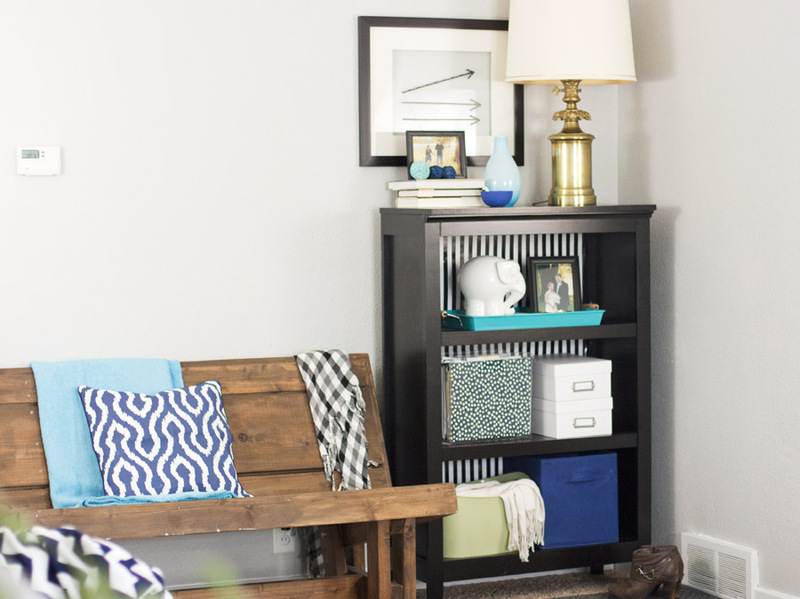 These are some “rules” I follow that help me style any type of shelving, and the same decorating know-how can be applied when styling other areas of your home like coffee tables or dressers or console tables, for example. 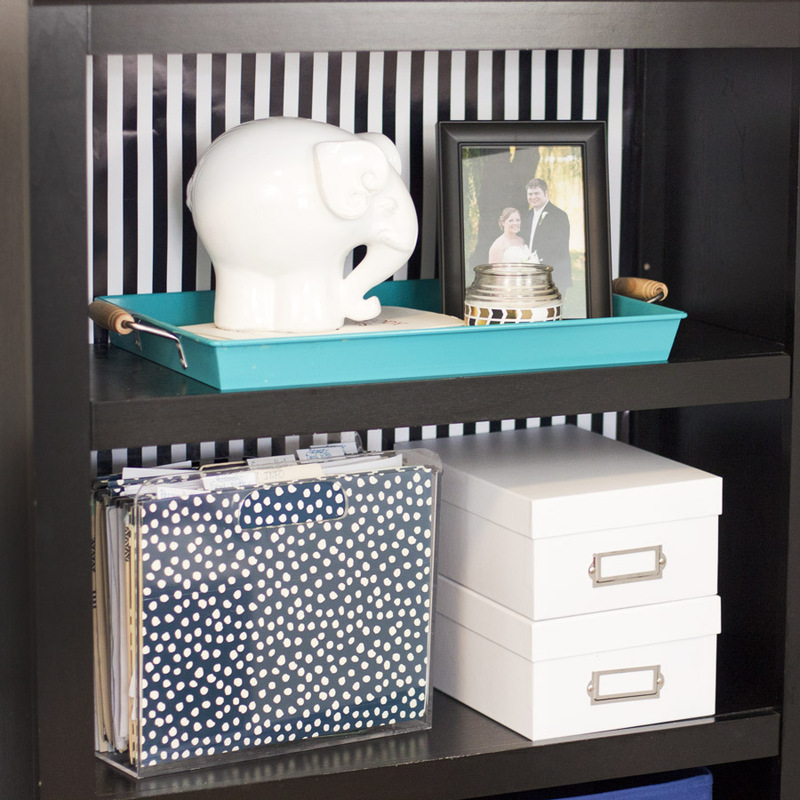 You don’t have to be born with a special decorating gene to achieve shelving that looks pulled together and stylish. 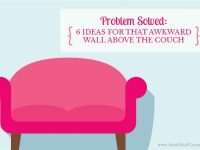 All it takes is knowing some basic strategies that can be applied in any home. 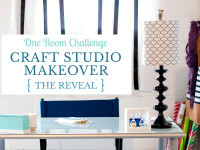 I am far from an interior styling expert, but these are the basic concepts that help take the stress out of decorating. Objects are pleasing to the eye when they are arranged in triangles. This means you’ll have a nice grouping of objects with a variation of heights, which is important for filling your space and adding interest. 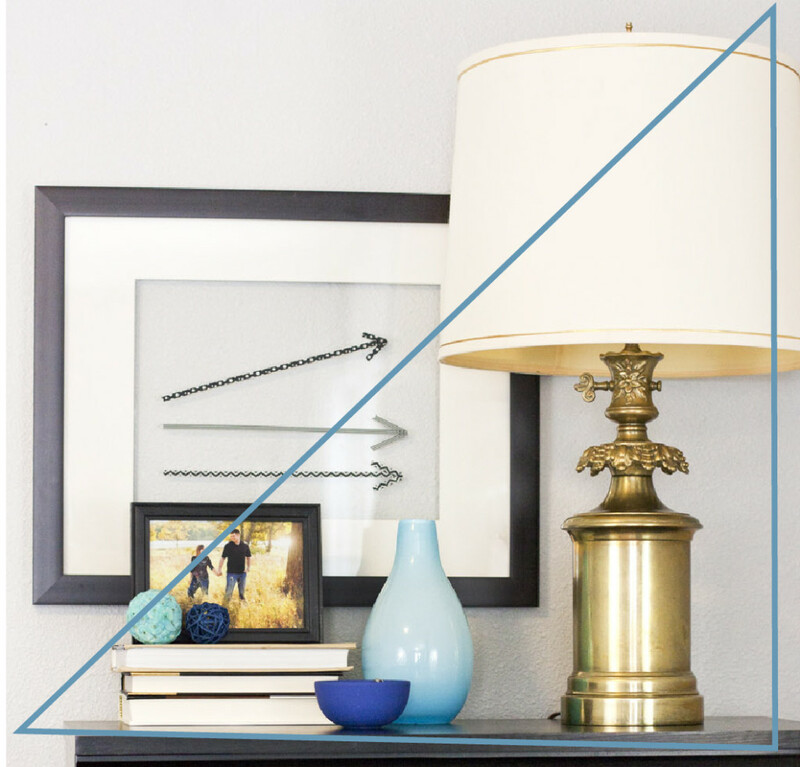 I almost always display things according to this triangle concept. For the little vignette on top of our bookshelf (pictured below), I used a stack of books to give the picture frame enough height to form the highest point of my triangle. Notice that the triangle doesn’t have to be symmetrical. If we zoom back a bit you’ll see that my small vignette forms a triangle on its own, but it is also part of a larger triangle that includes the lamp as the highest point. A classic rule of thumb in decorating is to group objects in sets of three or five. Odd numbers are the most pleasing to the eye. 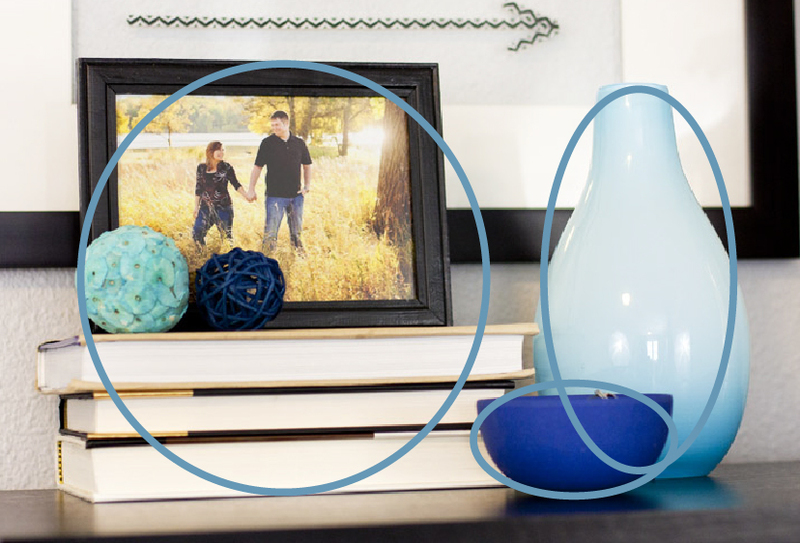 When you’re arranging things on your shelf, focus on using odd numbers of things to form your triangle. Your objects should be various sizes for this so you’ll have one tall item, one medium item and one short item. An exception to the triangle rule would be placing three of the same object together to showcase a collection. Because they’re all the same size and height, they will look uniform and pulled together. Take a look at the next few photos for some examples of how I arranged objects in odd numbers. 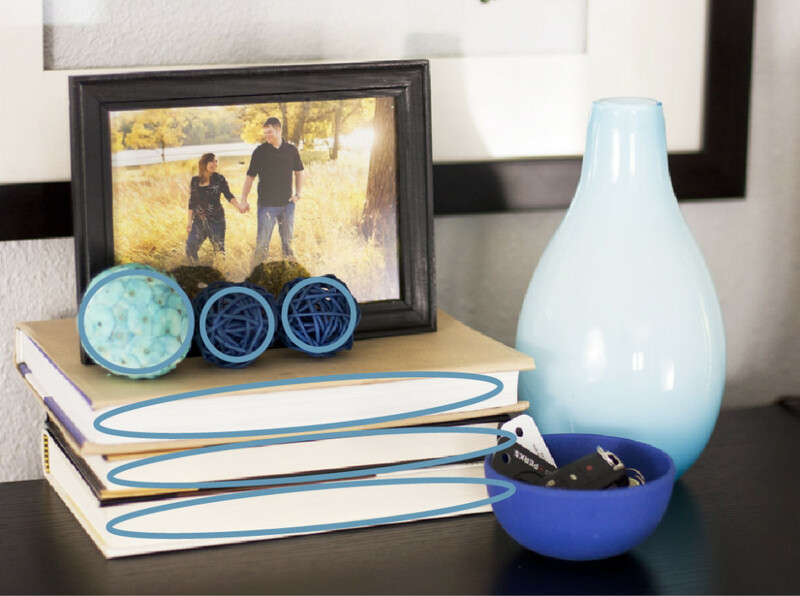 Notice that when I say object, it could actually be a group of objects like in the picture below where the stack of books, picture frame and decorative balls make up one cohesive object in my grouping. In the picture below, I used a stack of three books rather than just a stack of two. Also, you may notice that this picture includes three decorative balls instead of two like the photo above. That’s because I’d taken almost all of these photos before I realized that I hadn’t followed the rule of three there. Below, you’ll notice that the boxes and groupings on these three shelves combine to make a grouping of five, another odd number. I couldn’t fit a group of three boxes/bins on each individual shelf, so I instead looked at all three shelves as a whole and used the top one to break things up by creating just one object to make an odd number. Layers add such amazing dimension and interest to your shelving, and I think this is a key element that we often overlook. If you study those pretty magazine pictures you envy, they most likely incorporate layers of objects to create a collected and interesting look. I didn’t use a ton of layering in this shelf, but you’ll notice that the large frame hung above the bookshelf adds a nice layer. I also added a layer of interest to the shelf backing itself. This bookshelf is one of those cheap ones with a black cardboard backing, so I cut out some striped wrapping paper and applied it with double-stick tape to add some pattern and another layer to my shelf. Adding layers can be achieved in many ways. 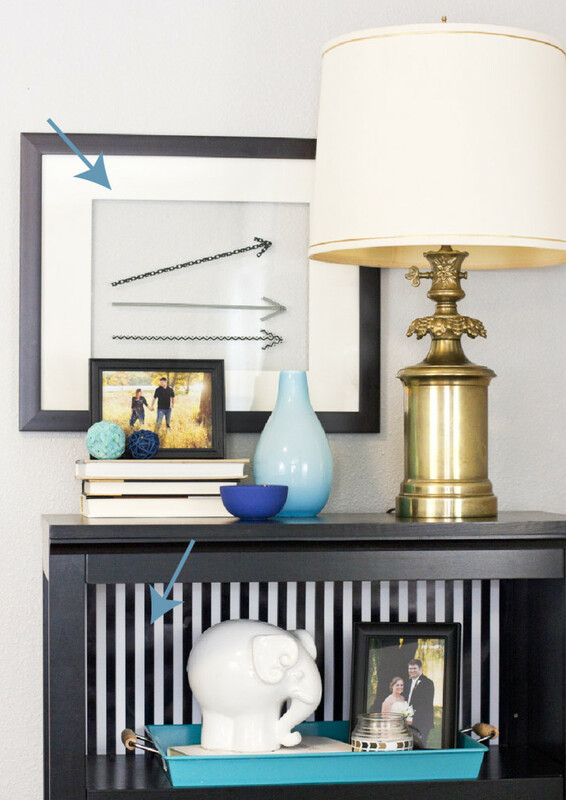 The simplest way is to use picture frames and art. 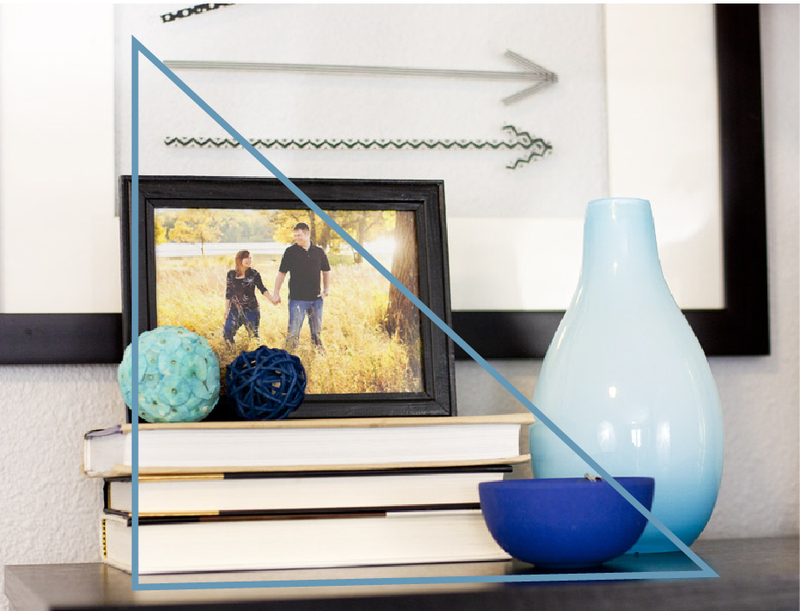 Lean frames against the back of your shelf and then style your triangles of objects in front. Don’t be afraid to layer frames on top of frames. Other layering objects could include baskets, trays and other fairly flat objects that can lean or hang against the wall. Trays and books are my go-to grounders. When you have a group of small items, they can look a little lost on a big shelf. Use a big tray or a stack of books as the base of your arrangements. This adds one more point of interest to your shelf and can really help pull everything together. 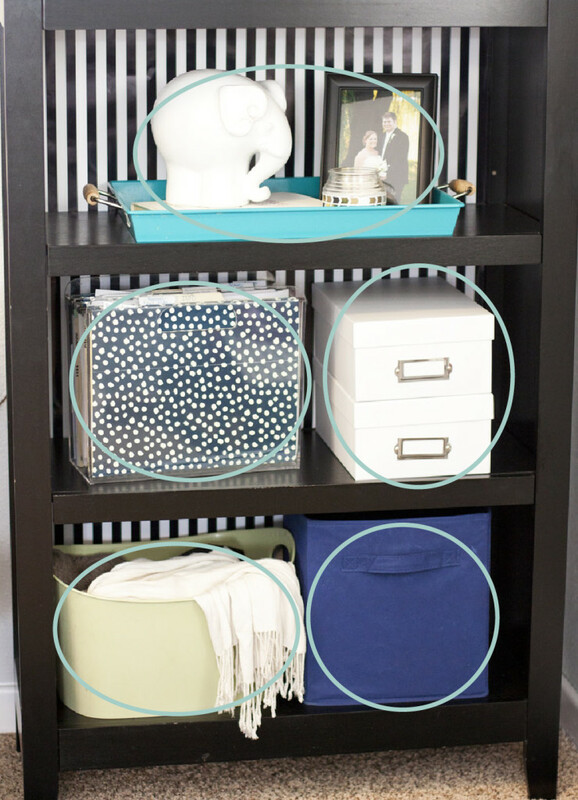 Vary the height of the items displayed on your shelf. This adds variety and helps form your triangles. So don’t feel limited by the size of an object you want to display, instead try setting it on a riser to achieve your desired height. Stacks of books are commonly used as risers. You can also get creative with other things like a basket or bowl flipped upside down, for example. While it’s great to vary the sizes and heights of your decorative objects, it’s important that you maintain some consistency with the colors. A steady rhythm of color spread throughout your shelving will look cohesive. So rather than lumping all of the blues together, spread them out evenly. I used white and blue arrows in the picture below to show you how I evenly distributed the whites and blues. See how your eye likes to follow the same color down the shelf? By alternating the colors on each side of the shelves, your eye goes side to side as it works down the shelf, which is a lot more interesting than if everything was in a straight line. 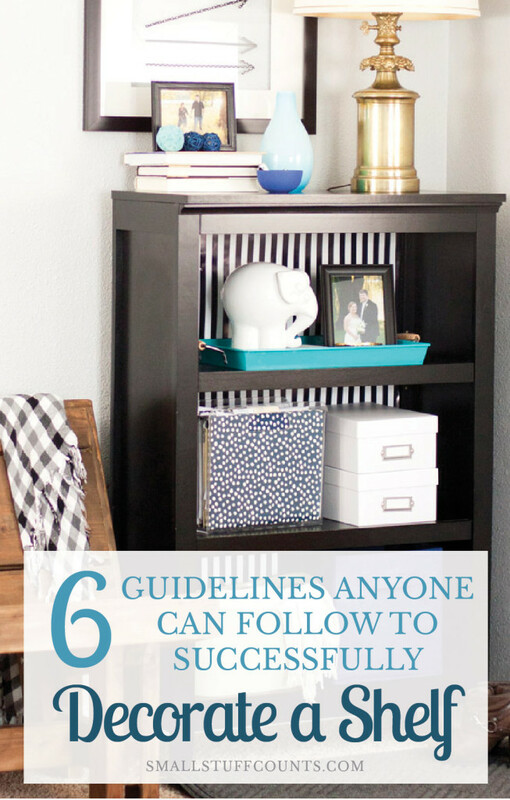 The rules I listed above are really good guidelines to keep in mind as you decorate your shelf. While these rules aren’t set in stone and there are exceptions, they are good guidelines to follow. I find myself thinking of these things whenever I’m decorating, and I have noticed a big difference in my interior styling by practicing them. I know you probably don’t consider yourself an interior stylist, and you don’t have to be. I really encourage you to practice because you will get better and better over time. No more feeling overwhelmed, just get started and move objects around until they feel right. I find it best to completely clear off all the shelving so I have a blank slate to work with. Do you follow these styling tips? Are you going to try using any of them on your shelves? Let me know how it goes! Glad you enjoyed these tips, Stacy! I hope you have found them useful when decorating your own shelves. Have a terrific day and thank you for visiting!